Fairbanks is Alaska's second largest city and the unofficial capital of the Interior. Surrounded by picturesque mountains and forested hills, this progressive city serves as the trade and transportation center for Alaska's interior. 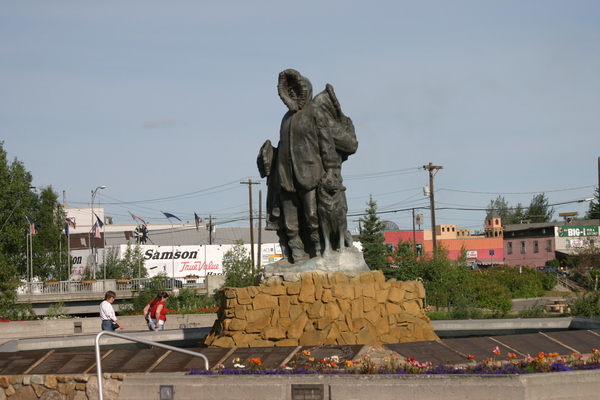 Fairbanks was founded by chance in 1901, when Captain E.T. Barnette was forced to disembark from the steamship Lavelle Young and set up a temporary trading post along the banks of the Chena River. Barnette made his temporary post permanent the following year when an Italian immigrant named Felix Pedro discovered gold nearby. The word spread quickly and a stampede of gold seekers soon reached the Interior. In the next 70 years, military spending and construction, the victory of statehood, the destruction of a flood and the discovery of oil left their effects on Fairbanks' history of booms and busts. Incorporated as a city in 1903, Fairbanks was named after Senator Charles Fairbanks from Indiana, who was later Vice President under Theodore Roosevelt, at the suggestion of Judge James Wickersham, a man of great political importance. In exchange for this favor, Wickersham made the town the seat of the Federal Court System. Needless to say, this did a great deal towards ensuring Fairbanks' future after the boom of the Gold Rush. Early miners cut trees to fuel fires to thaw the ground in their quest for gold. The supply of easily cut trees soon diminished and the miners ran into bedrock. In 1908, there were 18,500 people in the Fairbanks mining district. By 1920, this number had shrunk to 1,100. Dredge mining, an operation that required more capital than manpower, brought a revival in the mining industry that remained prominent until World War II. With the onset of war, jobs and activity in Fairbanks were augmented. Military construction for airfields, roads and communication systems meant jobs for civilians and increased sales for merchants. Statehood was achieved in 1959. The State of Alaska began as a poor one, with two-thirds of the labor force employed by the government in one way or another. The state welcomed its first wealth in 1968, with the Prudhoe Bay oil lease sale. The anticipation of new industry and jobs was dampened however, when petroleum development was postponed until the critical issues of Native land claims and environmental concerns were addressed. Pipeline construction brought a boom to Fairbanks in the 1970s. Campgrounds and RV parks are available in town as well as off the beaten path in scenic Alaskan wilderness. Denali National Park lies only 120 miles south of Fairbanks. Dog mushing remains extremely popular and many spectators can be found watching the weekend sprints at the track just north of town. The thrilling competition builds throughout the season and reaches a fever pitch with international participation in the Open North American race and the 1,000 mile-long Yukon Quest. Today, Fairbanks is an exciting city of contrasts. In addition to a host of remains from Gold Rush days, there are numerous recreational facilities and attractions that will remain memorable experiences for years to come. A chief support in the economy of Fairbanks through the years has been the University of Alaska. Congress designated land in the Tanana Valley for a land-grant institution in 1915. Six faculty members and six students originally comprised the agricultural college. The statewide administration for colleges and universities is still located in Fairbanks, as this was the main institution of higher learning in Alaska for decades. With over 9,000 students, the University is a large, modern, landscaped campus with something for all ages, not just the academically minded. UAF is the state's research facility, nationally and internationally recognized as a leader in arctic research and education. It is the home of the Geophysical Institute, the Institute of Artic Biology, the School of Fisheries and Ocean Sciences and the Alaska Native Language Center. The university also operates the nation's largest volcano observational network and a rocket range. It boasts the number one ranked museum in the state, walking tours, botanical garden and much more. Pick up a map when you arrive on campus to find the following activities and sites. The University's impressive Museum of the North wing opened in September 2005. Exhibit highlights include the state's largest gold display, a woolly mammoth and mummified steppe bison, Alaska Native art and artifacts and much more. The Museum's 1.4 million artifacts and specimens represent millions of years of biological diversity and more than 11,000 years of cultural tradition in the North. Hear the voices of the sun, the moon, earthquakes and the Aurora by visiting the Place Where You Go to Listen, an ever-changing sound and light environment. The Rose Berry Alaska Art Gallery showcases 2.000 years of Alaskan art from the Museum's archaeology, ethnology and fine arts collections. The Arnold Espe Auditorium hosts a variety of multimedia programs. The Museum gift shop sells an impressive array of jewelry, books, posters and native art. The Museum of the North is open in the summer from 9 a.m. to 7 p.m. daily and the rest of the year from 9 a.m. to 5 p.m. during the week and noon to 5 p.m. on weekends. Admission is charged. Call (907) 474-7505 for more information. To view the wide array of flowers and plants that grow in the northern climate, head to the Georgeson Botanical Garden for a self-guided tour. Admission is $1 and the diversity of flora will delight viewers of all ages. The Robert G. White Large Animal Research Station (LARS) is just down the road from the University. Part of the Institute of Arctic Biology at UAF, LARS provides a great opportunity to see caribou, musk oxen and reindeer. From LARS one can continue on to visit the only University-owned sounding rocket range in the world! Just look for the rocket on the right side of the road, 30 miles north of Fairbanks on the Steese Highway. Probably the best place for a family to play in Fairbanks is Pioneer Park. 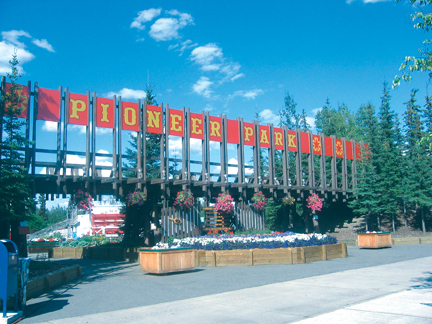 Previously called "Alaskaland", Pioneer Park is a 44-acre historic theme park with fun and adventures enough for everyone. You can begin your adventure with a train ride around the park on the Crooked Creek and Whiskey Island Railroad. From there, check out the many museums like the Pioneer Air Museum, the Native Village Museum and the Sternwheeler Nenana, which is a National Historic Landmark. 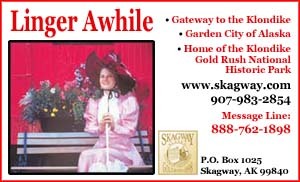 Travelers of all ages will enjoy viewing the 29 pioneer cabins and buildings of the gold rush town, which include the original 1904 Presbyterian Church, James Judge Wickersham's house, the Palace Saloon and Theatre and a variety of stores and eateries like Kaethe's Gold Cabin and Grizzly's Tent Camp Food. The Wickersham House, located at Pioneer Park, celebrated its centennial in 2004. James Wickersham, a prolific historical figure, was the first judge to sit in the Interior of Alaska in June 1900. He also led the first expedition up Mt. McKinley in 1903 with Olyman Cheah of the Tena band of Indians. In 1904, the Wickershams began building their home, which can still be seen complete with authentic furnishings, photographic displays and other exhibits. 1n 1908, Judge Wickersham was elected as Alaska's delegate to Congress. Located in the center of Pioneer Park, the Pioneer Air Museum is housed in the beautiful Gold Dome, a large tetrahedron structure designed by Buckminster Fuller. In an inspiring time, early pilots were testing the frontiers of flight as Alaska's great land mass was being explored on foot. The Museum houses over a dozen authentic aircraft and the memorabilia of Alaska's rich and exciting aviation heritage. The personal records of daring pilots and a unique collection of over 500 photographs chronicle the experiences of Alaska's brave men and women. There is a search and rescue place, a flight simulator, a 1966 US Army Bell UH1-1H Helicopter and one of the largest piston engine displays ever assembled. The Air Museum is owned and operated by the Interior and Arctic Alaska Aeronautical Foundation (IAAAF), an organization dedicated to preserving the aviation history of Alaska and educating the public about the past, present and future of aviation in the last frontier. Stories in the museum about early aviation pioneers continue to grow as contemporary pioneers achieve greater heights today. After exploring museums and the Bear Art Gallery, you can play mini-golf, rent a kayak or bike, enjoy a show at the Theatre and Saloon and dine on traditional Alaskan cuisine at the Alaska Salmon Bake outdoor restaurant. 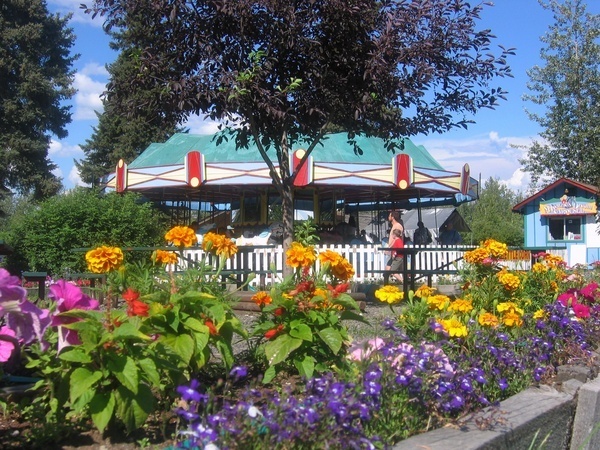 With so much to do and see at Pioneer Park, plan to spend several hours experiencing Fairbanks's favorite playground. RV parking is available. Most attractions are open from noon until 8 PM in the summer, and the Park itself has extended hours. History buffs and families will enjoy a tour of Ladd Field, known today as Fort Wainwright. Ladd was the first US Army Airfield in Alaska. The World War II facilities were designed to fulfill three purposes: cold weather experimental station, air depot for repair and testing of aircraft and the principle base in Alaska for the Air Transport Command. Today it is an Army installation and facilities have expanded to include modern barracks, family housing, medical center and other structures. Private tours can be arranged by calling (907) 353-6682. If you happen to be in Fairbanks in March, don't miss the creativity and beauty of the World Ice Art Championships. Carvers from all over the world travel to Fairbanks to produce these sparkling, temporary creations. The ice used for carving is harvested from local ponds in 5-ton blocks and is renowned for its clarity, density and slight glacial blue tint. It is so clear, that one can read a newspaper through a four-foot block of ice. Ice Sculpting has been added to the Winter Olympics as a cultural competition. Sculptors work single blocks for 60 hours in teams of two, or on twelve blocks for 100 hours in teams of eight. At the close of the competition, the sculptures are lit with colored theatrical lights. In most years the ice holds up well for three to four weeks in the specially designed "Ice Park". If you miss the event in March, some sculptures are retained in cold storage year round at the Fairbanks Ice Museum, located in the former Lacey Street Theater building. The Museum also shows a large screen multi image presentation tracking the process of creating ice art. The Ice Showcase is an 8000 square foot walk-in display area with over 40,000 pounds of sculptures. The summer solstice "Midnight Sun" celebration is Fairbanks' largest single day event, attended by 45,000 people. Held in the heart of downtown from noon til midnight on the longest day of the year, the festival presents three stages of live music, a wondrous array of arts and crafts, great food, dancing, gold panning, classic cars and gaming. Each July the Chamber of Commerce sponsors the World Eskimo Olympics. This is a fun event for the family to watch as the participants compete at Eskimo Stick Pull, Four Man Carry, Indian Stick Pull, Kneel Jump Knuckle Hop or Seal Hop, Blanket Toss, One Foot High Kick, One Hand Reach, Scissor Broad Jump, Seal Skinning Contest, Toe Kick, Two Foot High Kick, and the exciting White Men vs. Native Women Tug of War. The contests are held at the Big Dipper Arena at 19th and Lathrop Streets in Fairbanks. The Fairbanks Summer Arts Festival is a unique study and performance intensive training program. The Festival provides an opportunity for registrants to study with more than 80 master teachers who come from all over the world. As its mission states, "The Festival provides highly qualified guest artists offering informative and inspirational instruction for registrants at many levels of experience." The Festival is multi-discipline, offering classes in instrumental and vocal music, dance, theatre, opera theatre, storytelling, healing arts, visual arts and figure skating. Registrants can choose from over 100 classes held daily. Registration is open to adults ages 18 and older, experienced dance students 12 and older and skaters of any age. In addition to classes, the Festival offers a variety of performances featuring both guest artists and registrants. During the two weeks of the Festival, visitors to the Fairbanks area can enjoy everything from the informal "Lunch Bites," cabaret style performances given each day at the lunch hour, to more formal concerts. For more information on the Fairbanks Summer Arts Festival, please visit our website at www.fsaf.org or call us at (907) 474-8869. For the ultimate in adventure, visit Fairbanks between November and April. That's when you'll experience Fairbanks' secret season: winter. Watch the Northern Lights weave across the starlit skies, zoom down a wooded trail behind a team of huskies or enjoy a soothing dip in the local hot springs. Fairbanks claims to have invented winter! The Northern Lights have been seen as early as mid-August and as late as April, but visibility depends on the amount of light at the time of year. It is not dark enough during the late spring and summer months to be able to see them. This fascinating phenomenon is a part of northern life, as the aurora is visible approximately 85% of the time on clear, dark nights. This can be up to 243 nights a year. Whether hiking a variety of challenging trails, cruising through the countryside by snowmobile, hunting, fishing or watching a moose, the recreation is exceptional and all waiting to be enjoyed in and around Fairbanks. For the active adventurer, Fairbanks also offers flight seeing, rafting, boating, biking, ballooning and many more outdoor activities. Birdwatchers should be sure to visit the Alaska Bird Observatory in Fairbanks. This center for education and research hosts a nature center with bird watching information, educational displays, trail access to Creamer's Field Migratory Waterfowl Refuge, and gift shop. It is open Monday-Friday 10 AM to 5:30 PM and admission is free. For more information call (907) 451-7159. 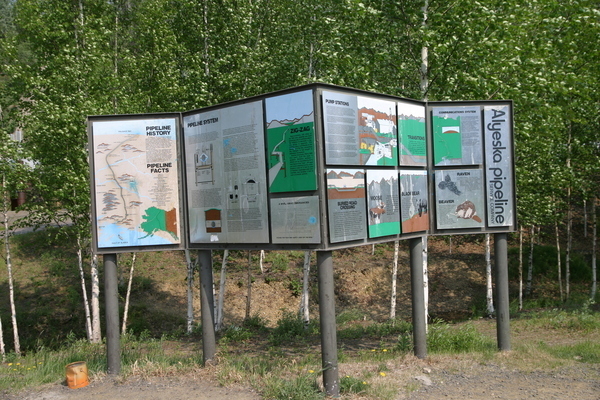 Just north of Fairbanks on the Steese Highway near Fox, visitors can make close contact with an impressive portion of the Alyeska (or Trans-Alaska) Pipeline as it passes near Fairbanks on its run from Prudhoe Bay to Valdez at a special pipeline display area. Since completion in 1977, the Pipeline has transported over 15 billion barrels of oil. The Fairbanks International Airport is close to downtown Fairbanks, with shuttles, rental transfers and bus service. Alaska Airlines and Northwest Airlines (during the summer) offer daily direct flights from Fairbanks and the Lower 48. Several regional and commuter carriers provide air service between Fairbanks and numerous interior rural communities as well as Anchorage and Canada. The Alaska Marine Highway System has been operating year-round since l963, with regularly scheduled passenger and vehicle service to over 30 communities in Alaska, plus Bellingham, WA and Prince Rupert, BC. Visitors can access Alaska—the Inside Passage, Southeast and Southwest, the Aleutian Islands and the Alaska Peninsula on the vessels of the AMHS fleet. Passenger and vehicle capacity as well as amenities such as staterooms, food service and observation lounges vary on each ship. A popular trip for travelers is to continue north via motor home to Denali. For more information visit www.alaska.gov/ferry or refer to the Alaska Marine Highway section of this travel guide. Ground shuttle service companies provide daily scheduled transportation throughout Alaska and the Yukon. Statewide charter services can also be arranged. Autos, trucks, vans and motor homes can be rented at a number of convenient locations. Rental cars, shuttles and taxis are available in addition to the Fairbanks North Star Macs Borough Transit Bus System. If you have a car or want to catch the bus, you can make use of the new 8.3 million 380-space Downtown Transportation Center and Parking Garage in the heart of Fairbanks. For one dollar an hour, you can park and walk around downtown. The Log Cabin Visitor Information Center is within walking distance and has information on attractions, shopping, dining, lodging and services. 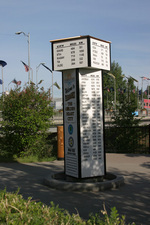 Or just pick up a copy of the Fairbanks Self-Guided Downtown Walking Tour to explore the past and present of Fairbanks. Originally built during World War II as a link between Alaska and the Lower 48, the Alaska Highway is a fully paved modern highway with services about 50 miles apart. 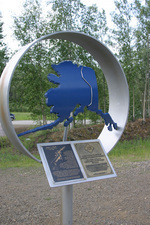 The Richardson Highway 4 is the home stretch of the Alaska Highway leading north to Fairbanks. The Steese Highway 6 heads north out of Fairbanks to the Yukon River, with about one-third of the road paved. The Parks Highway 3 links Alaska's two largest cities, Fairbanks and Anchorage, a 360-mile or 6 and 1/2 hour drive in the summer. The Elliott Highway 2 heads north from Fox to Livengood. The Dalton Highway 11, also known as the "Haul Road" closely follows the route of the trans-Alaska oil pipeline for which the road was constructed and is one of America's great motoring adventures with magnificent scenery. It is a narrow gravel service road with substantial truck traffic. Services are available at the Yukon River and Coldfoot. After Coldfoot, the next service center is 244 miles away in Dead Horse. 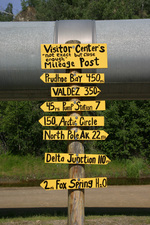 The Dalton Highway is open to the pubic for 496 miles north of Fairbanks. Security gates at Prudhoe Bay restrict access, though tours are available. The best time to drive the highway is between late-May and mid-September. Roads in Alaska vary from two-lane highways to narrow country roads. Some stretches have no shoulder. A unique feature of Interior Alaska roads and highways are frost heaves, berms and dips caused by freezing and thawing of the ground below the road surface. Exercise caution when approaching such terrain. Road construction and maintenance occurs in the summer, so be aware that you may encounter some construction. For an up-to-date report on road conditions, call (907) 456-7623. The Visitor Information Center also posts the latest road condition report from Alaska Department of Transportation or visit www.dot.state.ak.us. Fairbanks is your gateway to Alaska's vast interior and expansive Arctic. Head north to the Arctic National Wildlife Refuge (ANWR) and the gates of the Arctic National Park and Preserve, access the North Slope or the Arctic Circle. Visit Barrow, Fort Yukon, Anaktuvuk Pass, Galena, Coldfoot, Beaver, Ruby, Bettles and the Yukon River. Head south to Denali by a 4-hour leisurely train ride or short 2-hour drive. Auto rentals, air and ground transportation, guided eco-tours, fishing and boat charters and wildlife tours can be arranged through professional outfitters. Make Fairbanks your base camp as you explore rural villages, see caribou migrations and polar bear, hike in rugged mountains, float mighty rivers and fly-fish remote streams. Try a fishing charter for Arctic grayling, stay overnight in an igloo, take a jet boat excursion up a pristine river, try a snowmobile or dog mushing expedition or short flight over the Arctic Circle from Fairbanks. The choice of destinations is endless, from remote Alaska Native villages and the Arctic National Wildlife Refuge (ANWR) to the north and to Denali National Park and Kantishna to the south. You can select the individualized, group or specialized eco-tour that offers you the experience that meets your style. The Aurora Borealis, or Northern Lights, is probably the most beautiful and amazing visual phenomenon to grace the skies since the beginning of time. Visitors to the north are eager to glimpse a sight of the dancing curtain of lights and tour companies are creating opportunities to view the magic by providing dog sled excursions, sleigh rides or even heated "aurora" cabins. The lights are most often seen in the fall, spring and winter months, but can be seen up to 280 days a year in some areas. Researchers have found that auroral displays peak and wane on an eleven-year cycle. The peak of the last cycle was the winter of 2003. One Inuit legend says that the lights signal evidence of life beyond death. They believe that the lights were the reflection of torches carried by the deceased on their final journey. Gold rush prospectors thought the lights were a reflection of the "mother lode" just waiting to be found. Today's scientific explanation is that protons react against gas particles in the upper atmosphere and produce the glowing effect. Solar storms send the protons colliding with the atmosphere 68 miles above earth. The lights actually extend for hundreds of miles into space and can range from red to purple to green. The most commonly seen colors are greenish-yellow produced when oxygen atoms are at around 60 miles altitude. Red auroras are rare and are produced by high altitude oxygen atoms (about 200 miles). Nitrogen molecules produce blue or purple light. Auroral displays occur at the South Pole as well and are called Aurora Australis. The magnetic currents accompanying Aurora cause corrosion in pipes, including the Alaska Pipeline. Auroral light is produced by a high-vacuum electrical discharge—like a neon sign. Although it doesn't have the life-saving history of the Iditarod, the Yukon Quest is just as exciting and is becoming just as well known. The Yukon Quest takes its name from the old "Highway of the North", the Yukon River and traces the path that the prospectors followed to reach the Alaskan interior from the Klondike during the Gold Rush. This international sled dog race began in 1984 with 27 teams, covering 1,000 miles of rough and sometime hazardous terrain between Whitehorse, Yukon and Fairbanks, Alaska. This event takes place each year in mid-February when the weather can be unbearably cold. The starting point alternates between the two cities—even years from Fairbanks and odd years from Whitehorse. The dogs wear booties to protect their paws from the harsh ice and snow. Each musher must carry at least 8 booties for each dog, per 50 miles. That is about 8,000 booties! Food must also be provided for the dogs. A suggested ratio is 8 lbs. per dog per day. That is almost 1,000 lbs. of food. Dry dog foods have about 1500 calories pound so the dogs are burning 12,000 calories a day on the trail. Of course supplies can be shipped ahead to the checkpoints, they are not all carried on the sled. Dogs are checked by the veterinarians at each stop and not permitted to leave the checkpoints until the dogs in that team are in condition to finish the race. The shortest race was run in 1995 and was over in 10 days, 16 hours and 18 minutes. The longest Yukon Quest race finished in 14 days, 9 hours and 17 minutes. In 1902, Felix Pedro struck gold in a creek north of Fairbanks and the rush was on! The rapid influx of stampeders coming to the area to find their fortunes helped Fairbanks and the surrounding area grow into the second largest city in Alaska. There are many ways to experience gold fever today. If you want to just sit back and be entertained, the Palace Saloon at Pioneer Park offers a show called the "Golden Heart Revue". The Malemute Saloon at Ester Gold Camp is the home of the "Service with a Smile" show. Guests will be entertained by songs and stories of gold rush days as well as verse by Robert Service, famous poet of the north. Located on Chena Pump Road, the Pumphouse Restaurant and Saloon occupies a national historical monument which was constructed in the 1930s as part of the vast system of pumps, sluiceways and flumes the Fairbanks Exploration Company used to undertake their gold dredge operations. The rich, antique furnishings establish an authentic 1890s feel, and the menu is superb, featuring the freshest seafood and produce, "The World's Most Northern Oyster Bar" and the best wines of the Pacific Northwest. Another way to experience the adrenaline rush of striking gold is at a gold camp or dredge. Just north of Fairbanks in Fox, the El Dorado Gold Mine offers a permafrost tunnel tour, walking tour of the mining camp and a chance to pick up a shovel and find your own piece of Alaskan Gold. 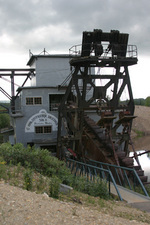 The history of gold mining is not complete without a visit to a mining dredge. 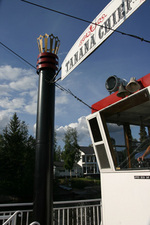 With several in the Fairbanks area, it makes a wonderful excursion for big and little miners alike. Within 30 miles of Fairbanks you will also find the Ester and Chatanika gold camps, both of which used dredging practices.